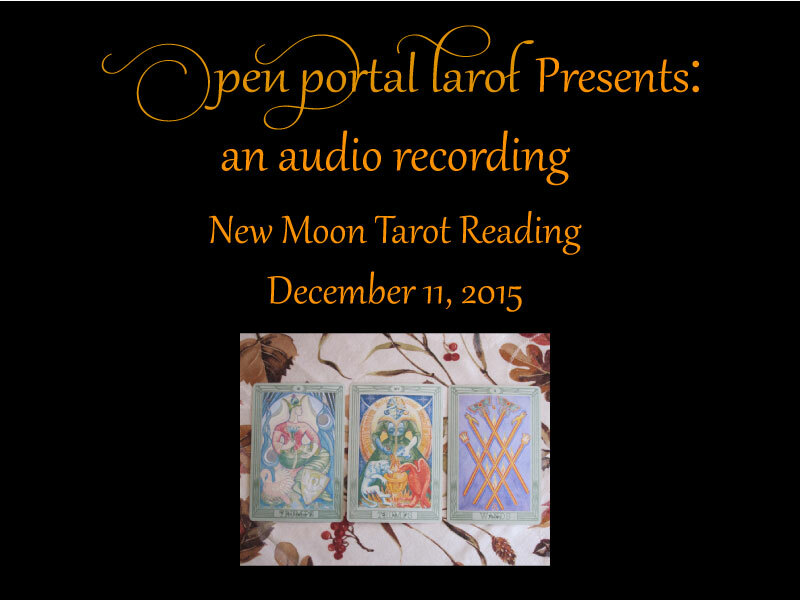 To watch a slideshow presentation with an audio recording of this reading, click here. 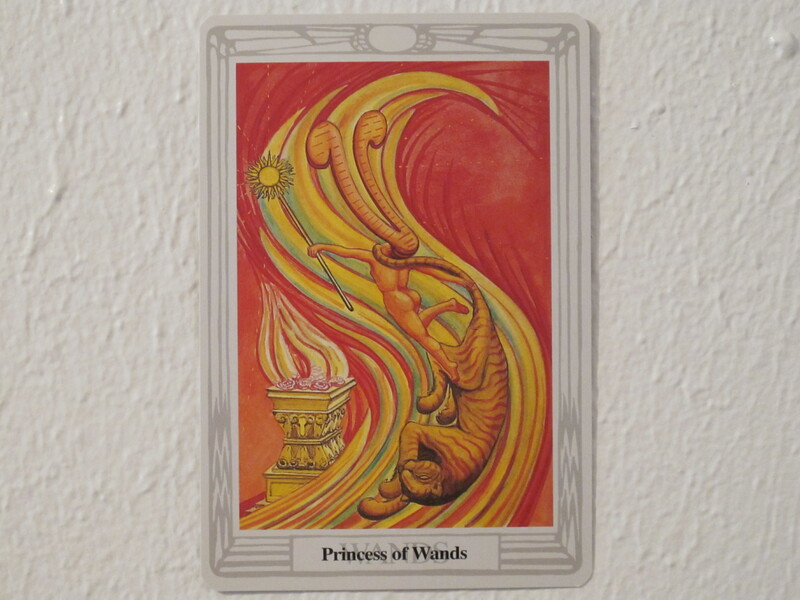 This New Moon supports transitioning from logical life-visioning to spontaneous life-creation. This supports the Heart’s ability to be aligned with non-converging forces that are all beneficial to the Self and others when those forces are in their positive poles. 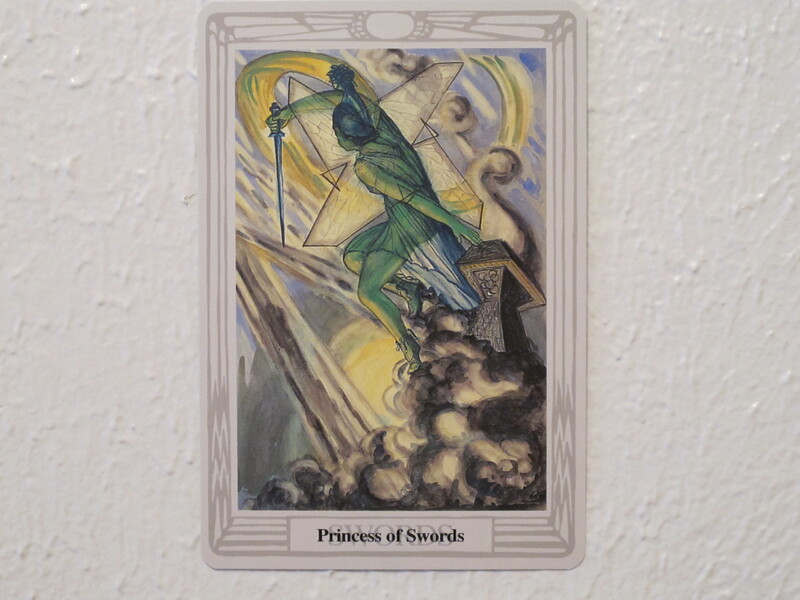 This New Moon supports initiating work around issues related to the 7 of Swords. 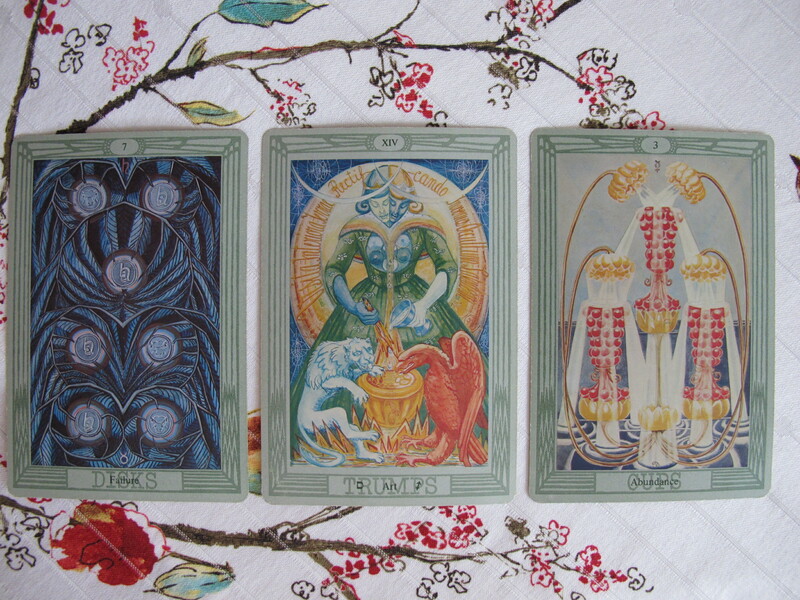 In this spread, the card stands between two diverging forces, Trump IV and the Queen of Cups. 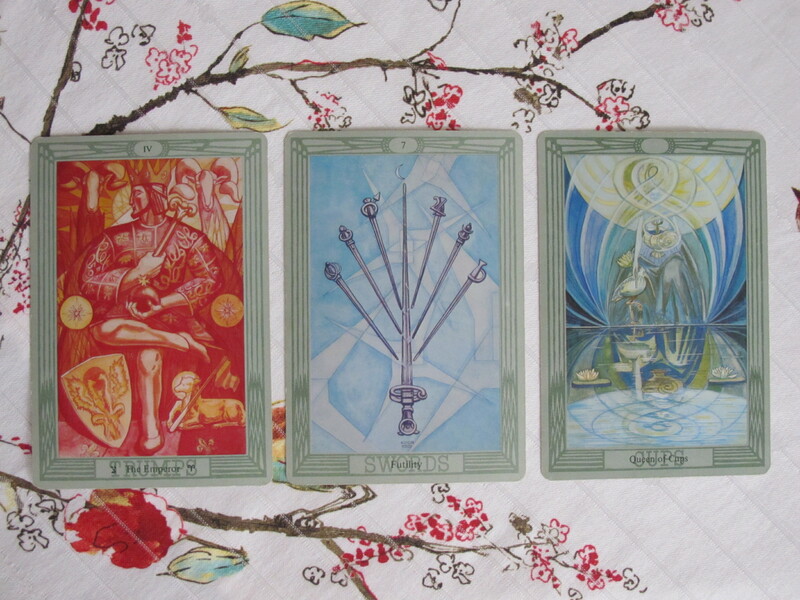 Its relationship to those cards heightens the significance of the card. 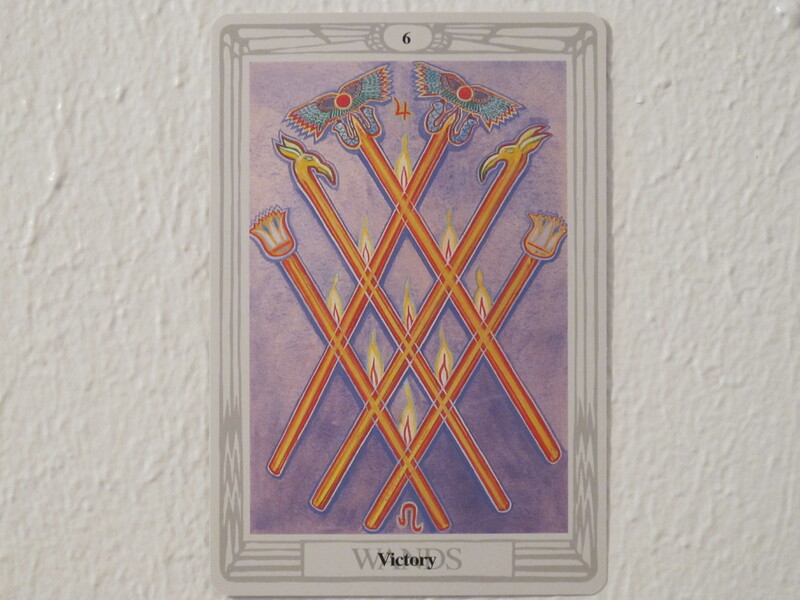 In the card’s image, there is a central sword bearing the Sun’s symbol intercepted by six small swords bearing the symbols of the Moon, Venus, Mars, Jupiter, Mercury, and Saturn. As much as each of these planets offers gainful qualities, no gain in any direction that serves the Heart’s work can be made while the mind gropes in the dark for a path of progress that logically combines all these forces. 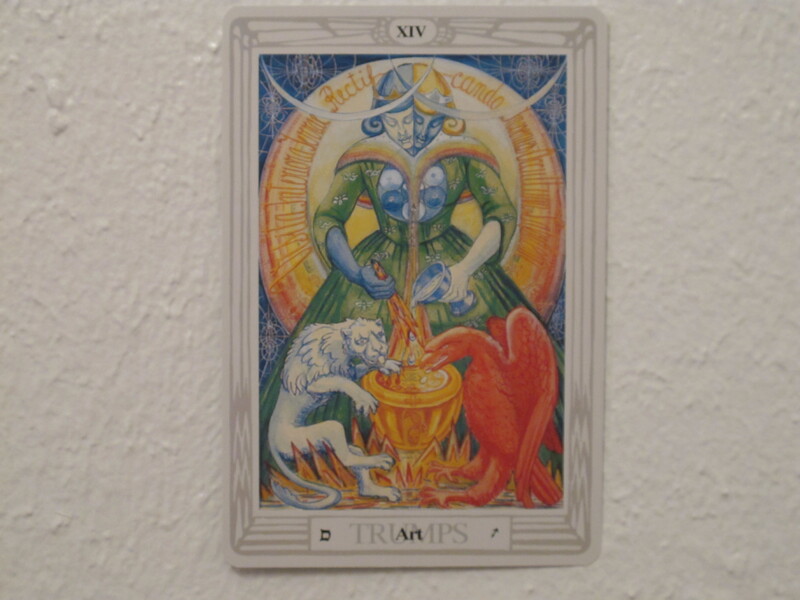 Similarly, the mind gropes in the dark for a path of progress that logically combines the gifts inherent in Trump IV and the Queen of Cups. 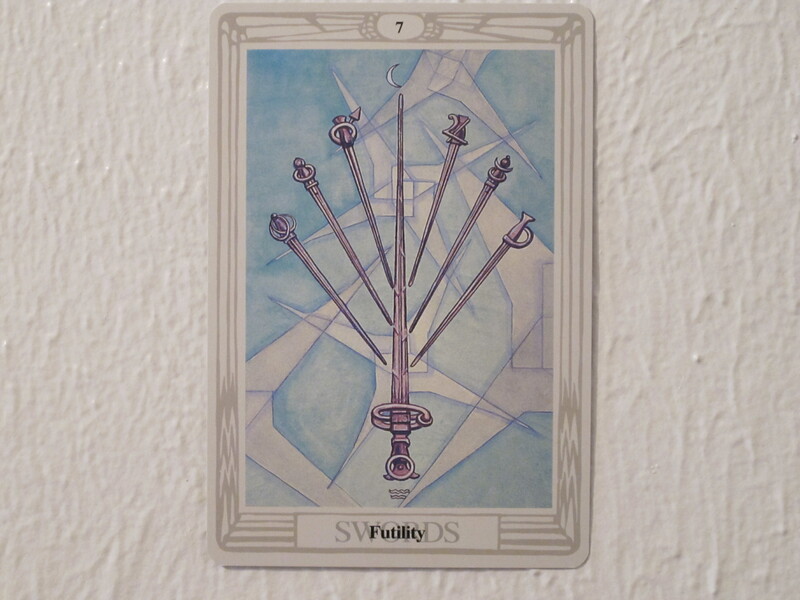 Considering the two cards to the sides of the 7 of Swords and the question posed at the beginning of the reading, the reading does not so much indicate that it is useless to try to assimilate dissimilar gifts as it indicates the limitations of mental processes in achieving the task. Even though the expression of all the planets represented in the image may draw heavily from skills and abilities which have engaged the mind, still, when those skills become channels for the flow of energy, it may be beyond the limits of the mind to orchestrate the activity. 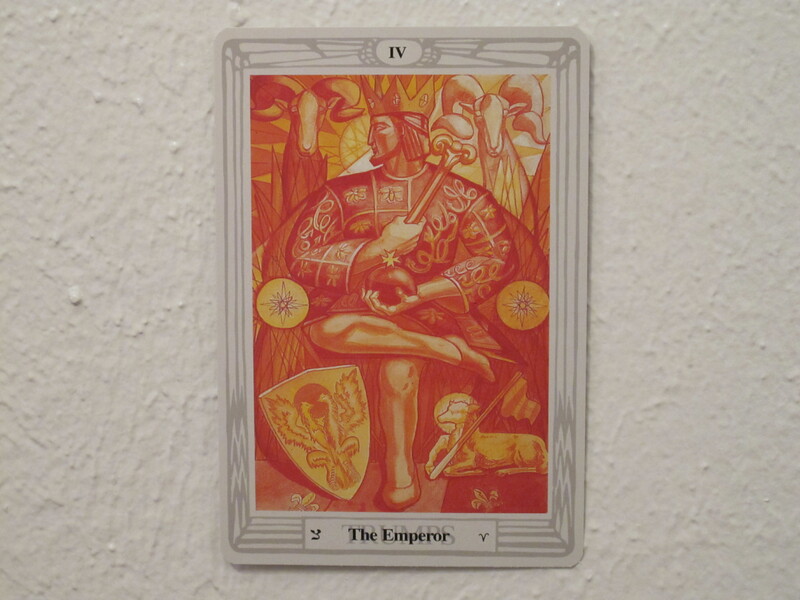 To the left of the central card is Trump IV with its dominant red ruler sitting crowned on his throne. 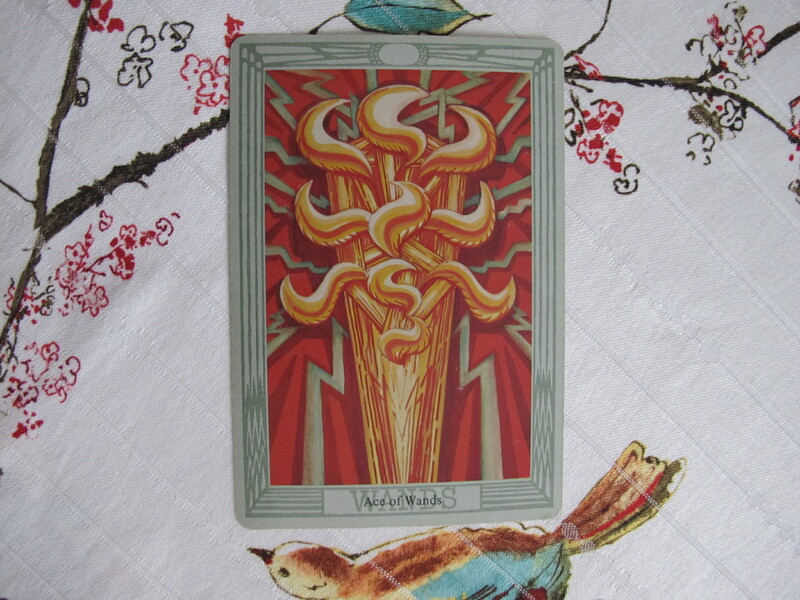 This image speaks of successfully tapping into a very grounded sense of “I am.” In that place of knowing, there is also a sense of untamed inspiration, adventure, courage, and advanced skills like the rams (Aries= Mars + Sun) flanking the ruler’s shoulders. It is a mastery to be acquainted with oneself to the extent that no other influence interferes with self-governance. A white light shines on the ruler from above, signifying an alignment with a greater consciousness. 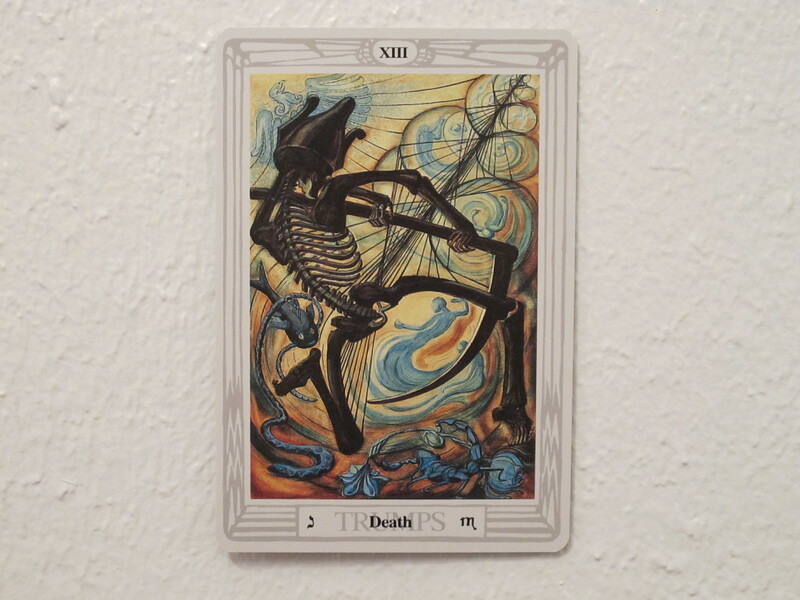 Just as the ruler’s gaze is turned away from the central card, so also this card in the spread creates tension that the mind has not yet reconciled. 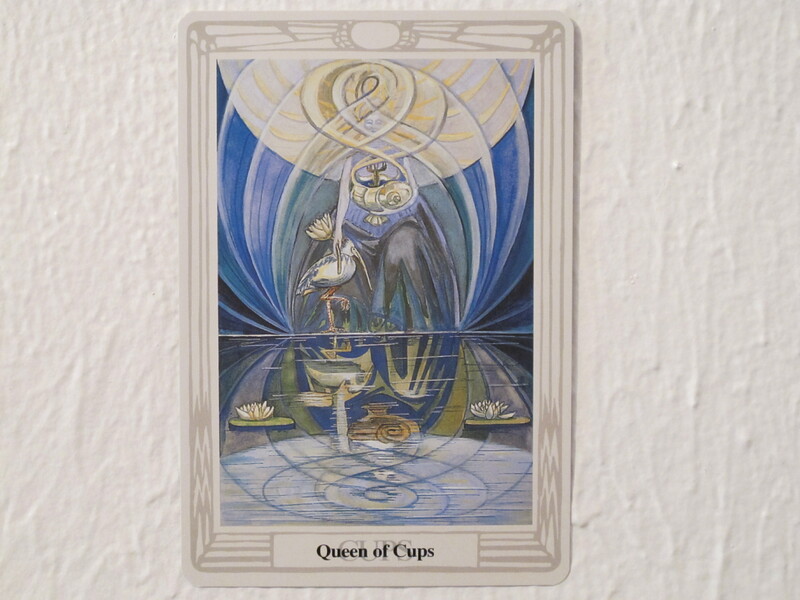 To the right of the central card is the Queen of Cups who proposes an entirely different ruler-ship in which mastery lies in the clarity with which one reflects others to themselves. 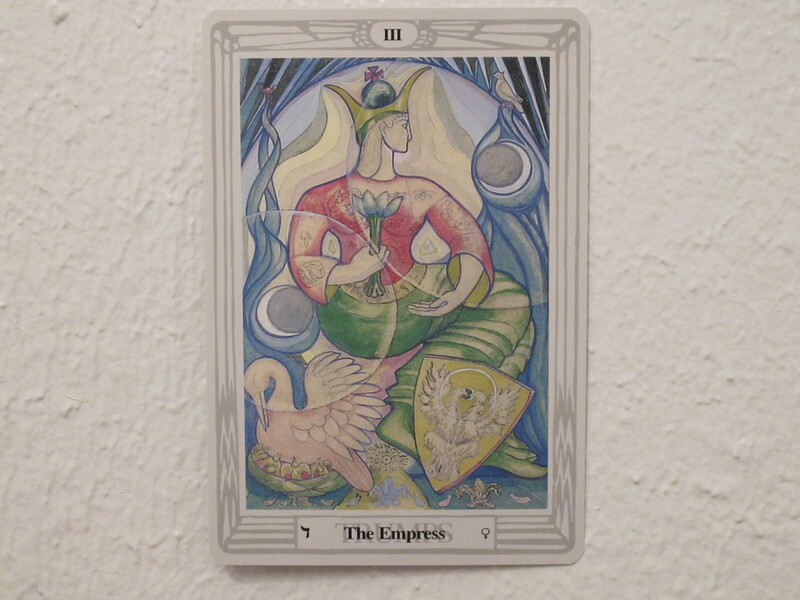 In the image, the crescent moons symbolizing the intuitive and creative consciousness veil the Queen mysteriously. She stands before water which in its tranquil state captures her reflection beautifully. Having developed herself in a deep way, she now has a multitude of resources that can be engaged as necessary to reflect others’ qualities to them. With that validation and acknowledgement, their gifts bloom and bear fruit. She is therefore a mother goddess, capable of nurturing the multitudes. So much is this Queen a maternal image that she herself forms the image of a cup, as in the suit of Cups where she reigns. Her body forms the stem, and the crescent moons crowning her are the bowl. She is an “empty vessel” like the Heart itself, into which the wine of life flows without effort from her. This selfless surrender to containing whatever waters that flow, or reflecting whatever visage that approaches is the opposing force to Trump IV which has a very concrete sense of personal gifts to express to the world. In the genre of children’s poetry, there is a book by Shel Silverstein entitled “Where the Sidewalk Ends.” This is relevant to this spread because the task of expressing Trump IV occupies time and energy in such a different way than the task of expressing the Queen of Cups that one becomes confused about how many involvements in the physical world one can undertake. This New Moon supports the exploration at the end of the sidewalk of self-regulation as facilitated by mental processes. Shamanic practices include vision questing. In a vision quest, a guide may appear to assist the individual when he/she has reached the outer limits of known experience. Thus, there would be guidance into safe new experiences, which allows for the growth of consciousness and the expansion of the Heart. 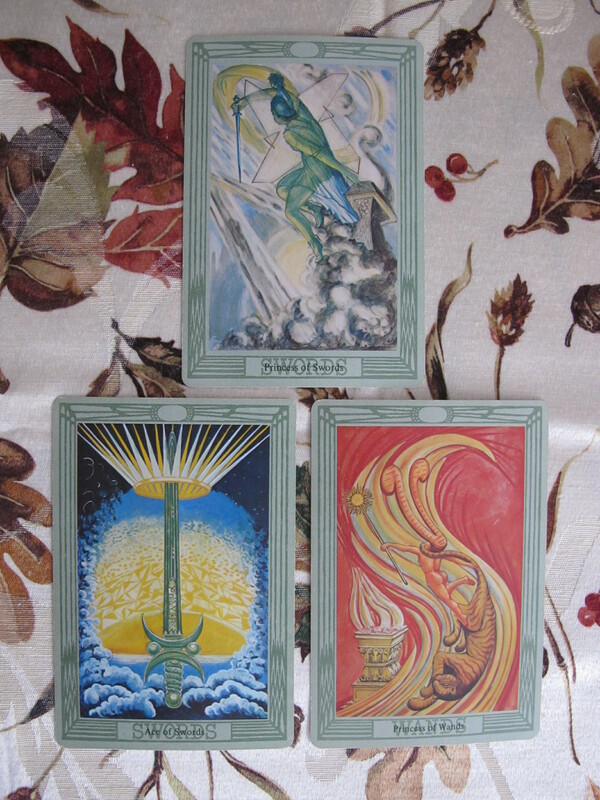 The Ace of Wands in this spread appeared when a guide for the spread’s work was requested of the Tarot. This New Moon is still the spiritual force behind the work. 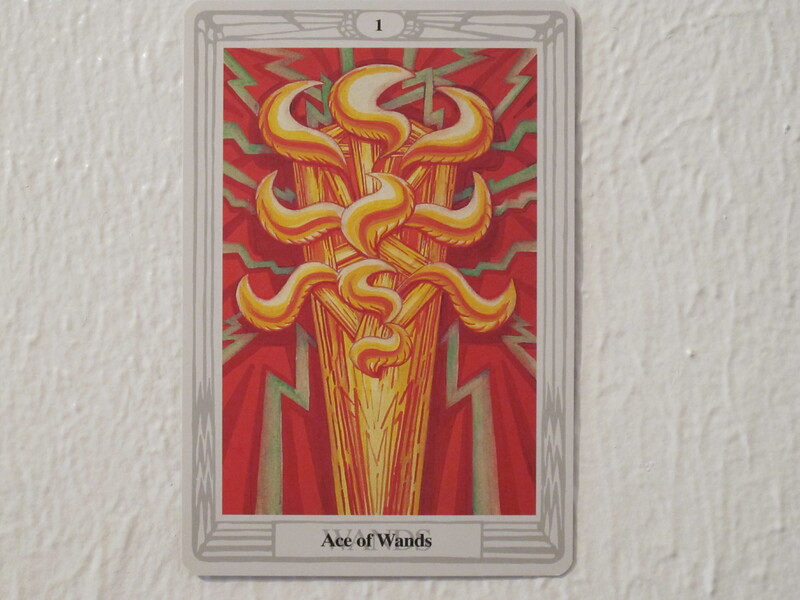 Additionally, the Ace of Wands and its image of the Qabalistic Tree of Life bursting with flames in the positions of the traditional sepiroths can assist the actual method of moving from mentally processing plans and intentions to navigating non-convergent currents which are aligned with the Heart’s visions for its gifts. Use the image meditatively and therapeutically to discover how to raise levels of trust and surrender while allowing the Heart’s operations that are beyond the mind’s radar to operate. This is the image that is the bone to throw to the barking dog of the mind which starts to tremble and chatter when it does not know the outcome. 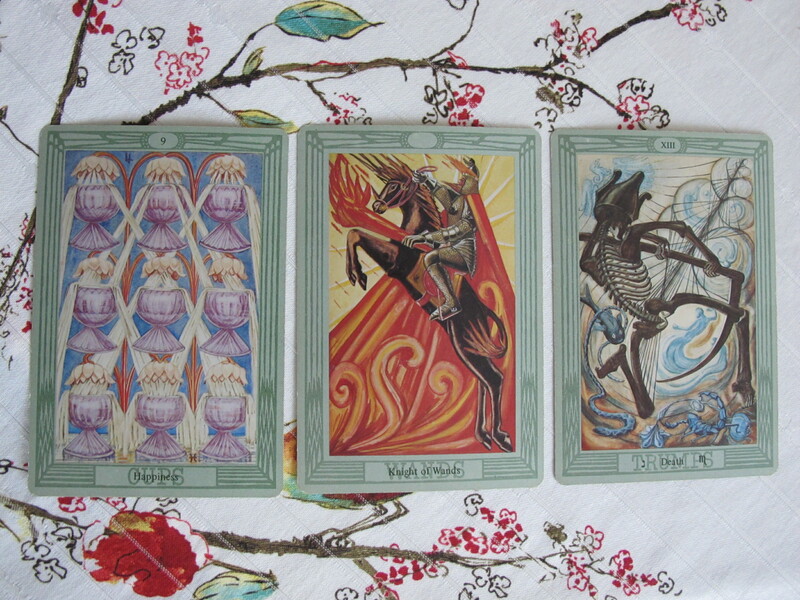 May the spiritual support of this New Moon and the support of all desirable guides be welcome into the Heartspace. 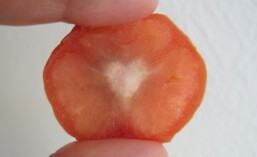 May the Heart find companionship and food for its journey from them. May the high-impact gifts that the Self has developed express themselves radiantly and accomplish the global service they are capable of in the world. May the inner reservoir of all facets of the human being continue to help fellow humans give birth to their life-changing gifts. May the walking of this path be simple and lit by an eternal light. May it be so for you, dear reader. May it be so for me. May it be so for all our loved ones and the people of this Earth whose lives we touch. Summary: This Full Moon supports the Heart’s current work of skillfully re-directing unfeasible desires for wealth and luxury to unlimited access to positive emotional and spiritual resources. In some religious philosophies, it is stated that we are fully human and fully divine. Somewhere in between, there must then be a crossroads where the two states act on each other, uploading and downloading experiences, and transforming the perspective the mind holds in order to accommodate the flow of new stimulus from both sides. 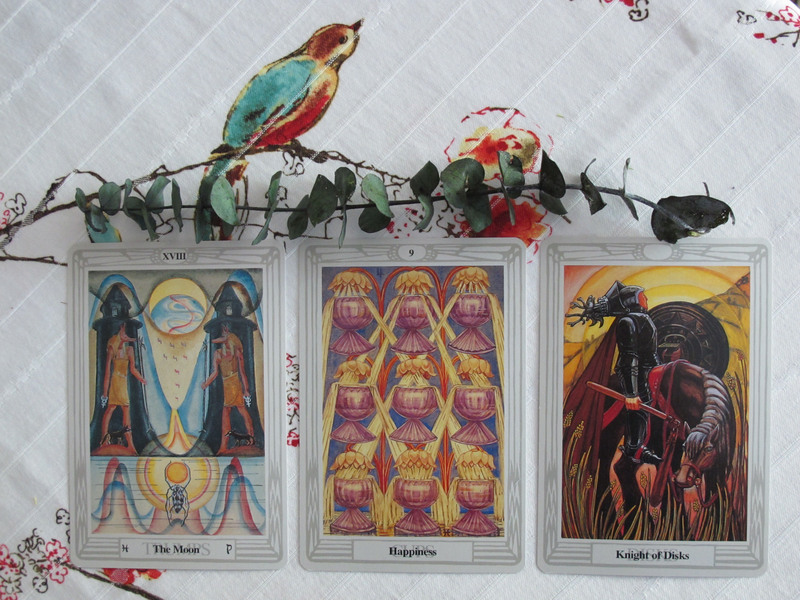 Trump XIV in this spread appears at the crossroads where this Full Moon can give supportive power. 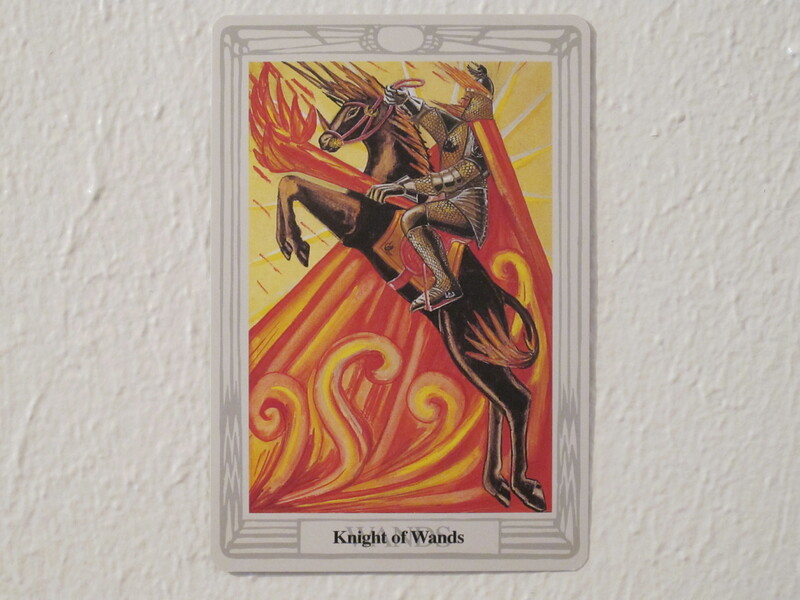 The central figure is half light and half dark, equally balanced, aligned with natural elements which have already understood and undertaken a balancing transformation (Fiery lion is white, Scorpionic eagle is red). The figure mixes an elixir of vitriol to dissolve the past while the future bulges and strains to emerge in the enlarged Orphic egg behind the figure. The inscription on the egg translates to “”Visit the interior parts of the earth: by rectification, thou shalt find the hidden stone.” What shall be the focus of rectification? This Full Moon offers its power to rectify the fully human desire for excessive wealth and luxury. It is there in every human consciousness, and some large percentage of people on Earth are exploring the range of experiences on its axis every day. 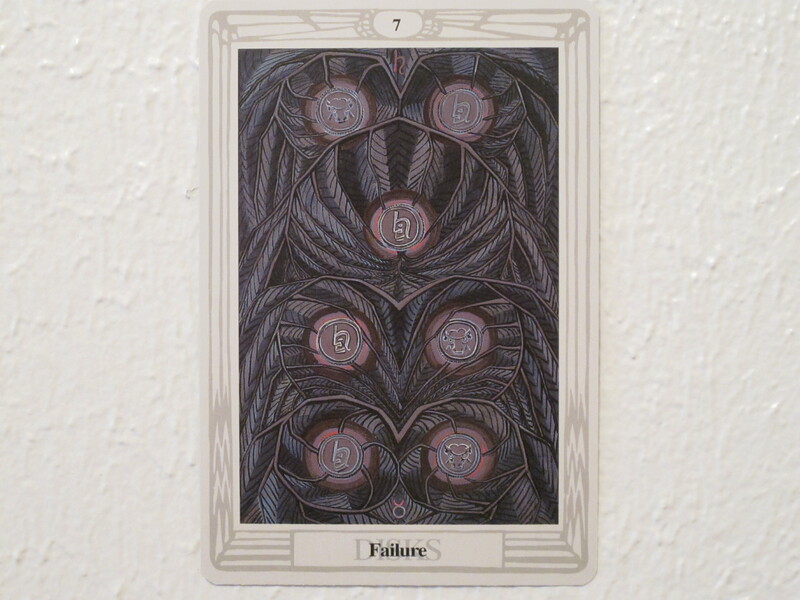 The 7 of Disks appears when such desires have bumped up against limitations such as one’s mortality, the number of hours in a day, and the rate at which wealth can multiply itself given current circumstances. As much as more decadent experiences (Taurus) would have been enjoyed, limitations (Saturn) appeared as corridors to other experiences. Would those experiences have to be as gloomy as the image in the card? Hell no! This Full Moon also shines its bright, silvery light on an alternative, that is, generating an empowering and resourceful experience of emotional and spiritual bounty. 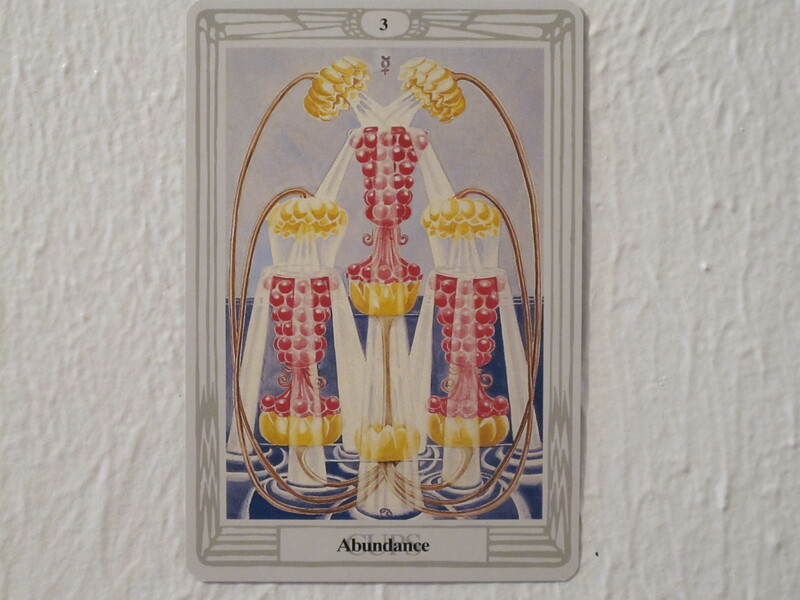 This bountifulness, shown in the 3 of Cups, overflows with love and happiness and the sense of eternity of these feelings. However, this is not the abundant bliss enjoyed by a fetus in its mother’s womb, or an infant suckling at his/her mother’s breast. 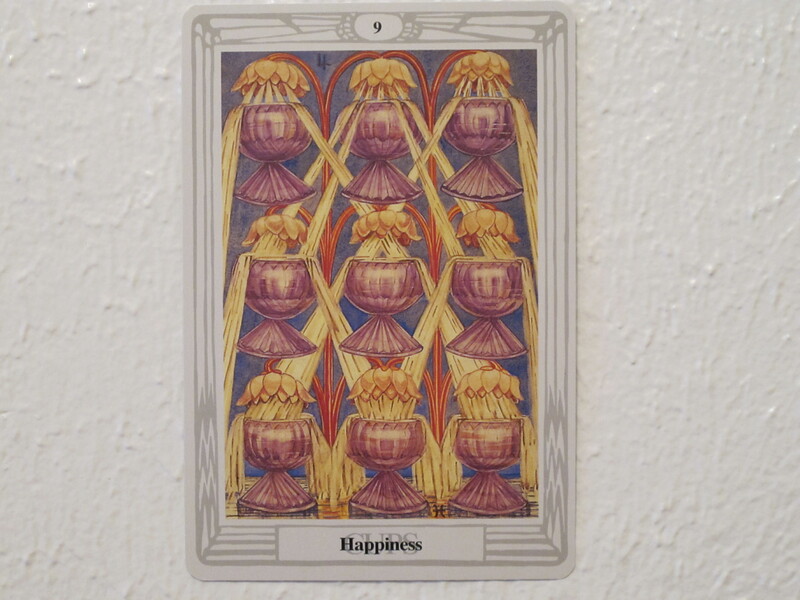 Going back to the central card’s connection to rectification of interior parts, the source of the 3 of Cups’ endless replenishment is a wise and mature experience. The cups are studded with pomegranate seeds, alluding to the Demeter and Persephone mythology in which because of eating a pomegranate seed on her way out of the underworld, Persephone became obligated to return to that world and her husband Pluto, lord of the underworld every year. 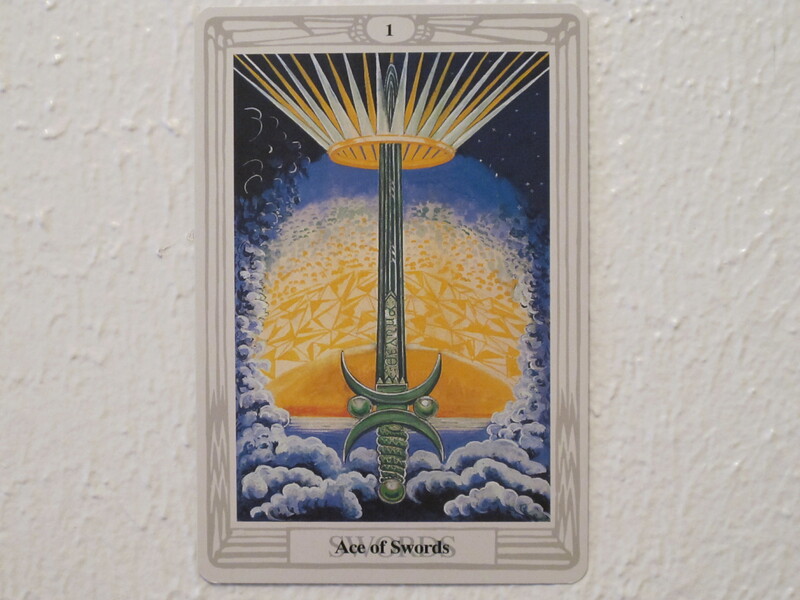 There is a connection between having realization about the excessive desires in the 7 of Disks and the passage to the underworld in oneself. We don’t tend to think of that passage as a magical, miraculous one, as Persephone was trying to leave the underworld when she ate the pomegranate seed, However, Persephone became acquainted with Pluto and the underworld as she was coming of age. Adulthood has different rites of passage than childhood. In adult life, maintaining a stable sense of inner wellness is connected to having some personal impact on the physical world. The passage to the underworld is not simply an escape or a withdrawal from everyday life. Rather, in astrology, Pluto is the planet that facilitates settling karmic accounts, orchestrating the appearance of task companions for one’s heartfelt initiatives and transforming global systems and perspectives that have passed their time, These are tasks that the conscious mind of an individual simply can not tackle alone. That does not mean that they should not be considered. It just means that the passage to the place in the Self where those initiatives are fueled needs to be discovered. 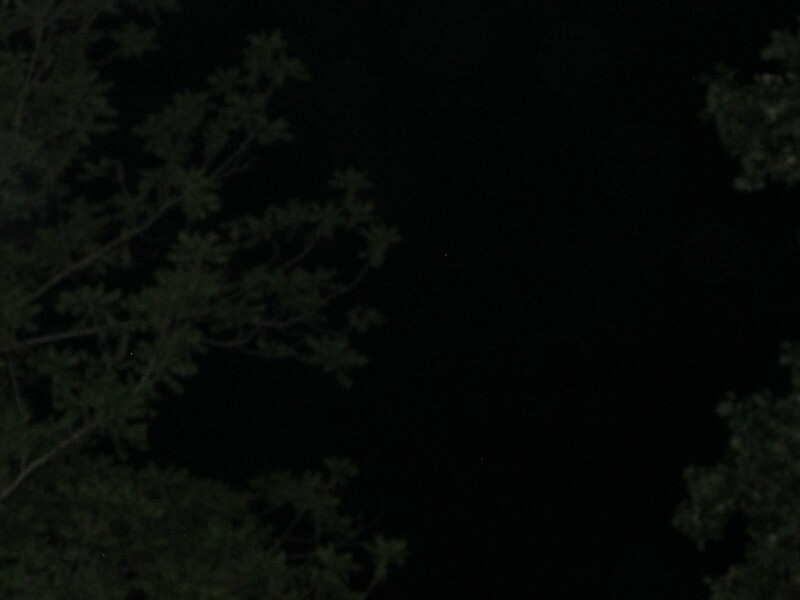 This Full Moon is longing to help. May the Moon, all helpful spirit guides, saints, and the one Divine be welcome in the Heart. May the Heart’s call for attention on matters of the Soul and global transformation be heard above all other noise. May activities that nourish the Heart be done to fuel the passage to the underworld. May that journey be protected and guided however necessary. May new life that is magically bountiful emerge from that journey. May the entrance to the passage be available again as a form of spiritual mastery. May it be so for you, dear reader. May it be so for me. May it be so for all who we love and the people of the world who we lovingly pray for as well.